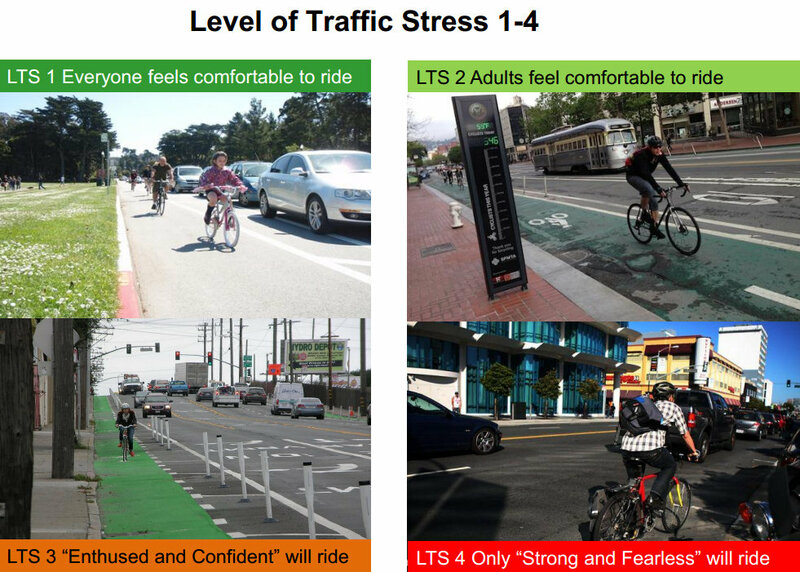 The four levels of "traffic stress" experienced by people on bikes, as defined by the SFMTA. The SFMTA Board of Directors voiced strong support yesterday for pursuing the most ambitious vision laid out in the agency’s draft Bicycle Strategy, which calls for a system of safe, comfortable bikeways that could elevate the level of cycling in San Francisco to levels seen in cities like Copenhagen and Amsterdam. Where the funding to implement that vision will come from, however, remains to be seen. The Bicycle Strategy currently lays out [PDF] two primary scenarios to make bicycling accessible to a broader segment of San Francisco’s population. The “Strategic Plan” scenario, which the SFMTA estimates would increase bicycling to an estimated 8 to 9 percent of all trips, would require $200 million over six years. The “System Build-Out” scenario, which is projected to meet the city’s goal of 20 percent of trips by bike by 2020, is budgeted at $600 million. Though the board didn’t take any action on the Bike Strategy, there seemed to be a strong consensus favoring the boldest option — and not only among vocal bicycle advocates like Cheryl Brinkman and Joél Ramos. After reviewing the SFMTA’s “needs assessment” map, which marks the most stressful parts of the bike network in red, board member Malcolm Heinicke pointed out that many of the streets deemed too intimidating for anyone but the “strong and fearless” to bike on — such as most of Market Street — are also some of the city’s most important routes and destinations. 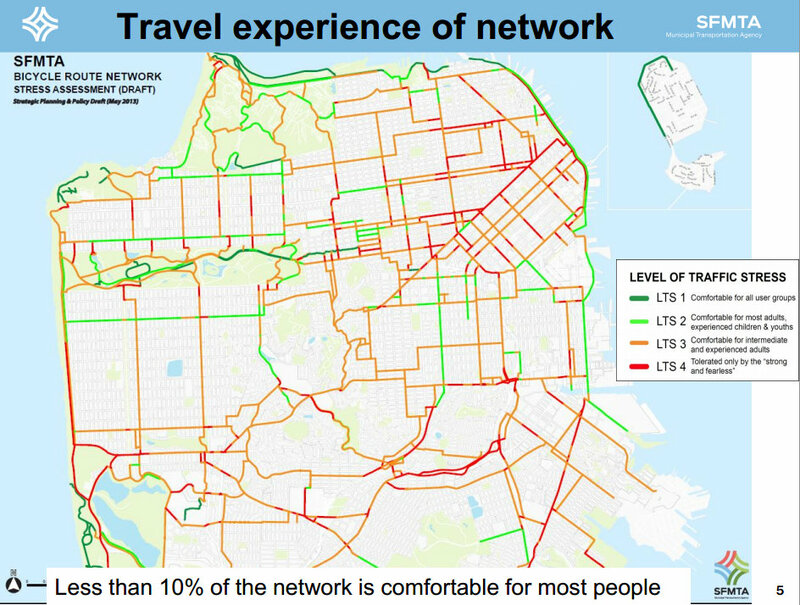 Less than 10 percent of streets on the bike network are deemed comfortable for most people. The latest version of the SFMTA's "needs assessment" map of the city's bicycle network. “When I see your map that shows Market Street as a red line, we’re basically saying bikers can’t go where everybody else in our transit system wants to go,” he said. “If you want to ride with your small child on the back of your bicycle, you should absolutely feel comfortable doing that,” she said. The full build-out was also backed by board member Cristina Rubke, who relies on a motorized wheelchair. Rubke said she rode a bike for the first time this month at an event that allowed her to try out bicycles designed specifically for people with disabilities. “Pretty much anyone can ride a bike, as it turns out,” she said. Enthusiasm from supporters, however, was tempered by a reminder from SFMTA Director of Transportation Ed Reiskin that the agency currently lacks a plan to fund even the $200 million scenario, let alone the full build-out. “To think that we’re going to easily be able to find something on the order of $600 million is a little bit difficult to contemplate,” he said. The SFMTA currently spends just 0.46 percent of its capital budget on bicycling, but officials say the agency is strapped for money, especially for Muni. Although Mayor Ed Lee has made clear that San Franciscans can’t rely on him to help fund safer streets for bicycling, there’s still hope in the Transportation 2030 Task Force he formed, which is expected to release recommendations on how to increase funding for the city’s various transportation ambitions this fall. Where to fund the build-out? How about scrap the Central Subway? Then you could do the full build-out x 2. I love transit in almost any form, but in terms of cost-effectiveness, one of these things is not like the other. If we’re going to “Copenhagen-ize,” we also need 100+ bike racks at every major transit station. EMB is interesting and I’m glad they showed two lines – the mixed use path next to the water is LTS 1, the bike lane next to parking/traffic is LTS 4 (complete FUBAR). Sadly, the mixed use path is beyond capacity in many points and isn’t really set up to be a viable bike route. Shouldn’t the Great Highway from GG Park to Sloat be dark green, since there’s a decent (if bumpy) mixed-use path? But how are the LTS 2 and LTS 3 images any different? And can’t we do better than the LTS 1 image (e.g., bikes separated by a real median or elevation from the parked cars)? There’s a big difference between mid-market and Cesar Chavez. Trust me. That cyclist in the Chavez photo is headed for a merge across high speed traffic entering US-101 in order to get to a sketchy bike undercrossing of the freeway. Valencia is LTS 2? Whaaaaaat???? What are they smoking over there?? There’s a difference coming up, sure, but you’d think the purpose of the photos would be to show the difference. There must be a lot of “extremely intrepid” people in California. And to think I regularly take my kids on rides using infrastructure designated as something only the “strong and fearless” should ride on, simply because I have no other choice in getting from point A to point B on a bike in this town. That, my friends, is really disappointing. How is the budget of the SFMTA determined? Isn’t there any way to increase the ridiculously low amount spent on bicycling which only represents 0.46%? Mike, well if it’s a mixed-use path then it’s not a bike route, and so shouldn’t be regarded as one. It’s the same disconnect that exists on the Panhandle north mixed-use path. Bicycles try and treat it like an express commuter bike lane, despite the huge SLOW sign as you enter, when in fact it is a recreational path for all. To my mind, on a true mixed-use path, faster traffic should defer to slower traffic, i.e. pedestrians. So mixed-use roads (sharrows) should have drivers that default to the slower cyclists, correct? Mike, are you saying that bike riders on mixed-use paths should behave in exactly the same inconsiderate way towards walkers as drivers do on mixed-use roads towards cyclists? I would have thought cyclists would be much more considerate towards slower traffic precisely because that is their usual situation. The picture is more mixed, but I have had a cyclist yell at me on that Panhandle path because I was “not keeping right”! No, I was saying that your original comment was stupid. Wrong. No less an authority than the City and County officially regards the Panhandle path as a bicycle route: “Bike Route 30”, as a matter of fact. Zack, we might as well accept that Central Subway is going to be built, and save our energy for other battles. And, as I feel sure you know, the vast majority of the funds being used to construct CS are from outside the city, and therefore would not in any event be available for other SF transit projects. I think you’re going to have to let this albatross go. Point taken on the overrun though – didn’t know that. San Francisco’s State of Cycling: Is It Falling Behind?